If you’re wondering what’s moving and shaking in Commercial Real Estate these days or who is actually implementing Smart Buildings (and does it work? ),Realcomm/IBcon is the event to see and hear the latest. It was our second year attending the conference, but this year we came with a fresh look, brand, and vision. It was a major success, but mostly made us very excited to be a technology player in this evolving sector at a crucial time. The commercial real estate industry is missing a clear data visualization solution - WRLD holds a key position in helping understand what’s really going on in our buildings and facilities with our 3D maps. As an industry, both real estate and building automation is still in the infancy stages, but the proliferation of property, location and IoT data is growing exponentially. It was markedly clear to us that the next stage to organizing and visualizing data is giving it spatial context for actionable insights. Many of the building operations and technology companies we spoke to strive to provide a holistic view of buildings and management systems, but most lack a true visualization layer that accurately depicts the physical world. The value our 3D maps provide was immediately understood by these companies at Realcomm. Many of these building systems work in silos and require an open and intelligent integration platform such as a 3D map to plug in sensor and performance data, such as from HVAC systems, so facility managers are empowered to make better decisions and detect and diagnose issues faster. Unified spatial analytics has the potential to transform the occupancy experience, operational costs, and overall efficiencies in smart building management. Intuitive spatial visualizations deliver faster insights, and with this knowledge comes the power of intelligent prediction. Same map, different customizable experiences. Our 3D maps also allow for select visibility of relevant content served to facility managers, occupants, executives, or even just visitors to a building or venue. Many companies saw the value in being able to easily create different user experiences using the same base application. To be able to strip away base level needs for executives who need to only see where open meeting rooms are available and where employees sit, was something previously unheard of to everyone we met. Flexibility, customization, and control are key differentiating factors to using the WRLD platform. We are also a cloud-based streaming map available on web, mobile, desktop, VR and AR, so that map owners can make updates to their application and see it on any platform or device immediately. Do you know that we spend 90% of our time indoors? And soon every phone will know exactly where it is at all times indoors, down to the millimeter. This newfound capability will unleash billions of dollars in value; we’re already seeing innovative indoor solutions for enterprises, hotels, airports, shopping malls, and other large connected spaces. For example, we met large hotel property operators and developers who were very excited by the opportunity to track and visualize when guests check out through our heat-mapping feature, so that they efficiently route their housekeeping staff to the ready rooms and optimize usage of their resources and services. Some companies we met really valued the seamless outdoor to indoor navigation and asset tracking capabilities we can provide. As these companies are tracking such things as mail, supply & inventory, and printer fleets, they require a complete picture of their assets in motion, which includes both indoor and outdoor environments. Many commercial real estate developers and property owners require building renderings for simulation modeling. Many don’t have these readily available or accurate. Our solution almost seemed too easy, especially as they can own their own building data for private control. Our proprietary engine quickly renders 2D floor plan data to 3D, and our true to life visualization creates an intuitive understanding of any space. We can build to any level of detail - so basic, procedural renderings could serve the owners’ need to run various simulations. Our map is a digital twin of the physical world - we want to not only be an accurate representation of your space but also a beautiful and engaging one! 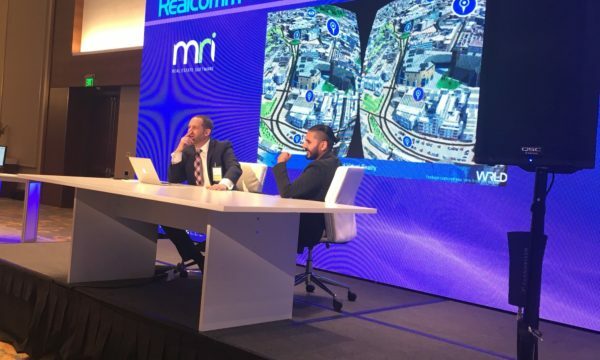 Mark your calendars, we’ll be on a Realcomm webinar panel discussing the future of augmented reality for real estate on 10/26 (sneak peak below) - sign-up here!